The Weathersongs Installation produces continuous unending ambient music that shifts and changes with the weather and the seasons, sounding slow and languid on warm, still days and wildly chaotic in times of storm. It is a music which both reflects prevailing conditions and blends with the sounds of its environment. 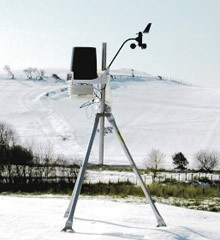 The installation comprises a automatic weather station connected, via a computer, to an electronic musical instrument. The program gathers data from the weather station regarding air pressure, temperature, rainfall, humidity, wind speed and direction and uses it to compose music in near real time. Thus, when the wind blows, phrases are generated whose pitch, intensity and statistical density reflect wind speed and direction; other notes change with the rise and fall of temperature or pressure; and random percussive events occur with changes in rainfall. While this is not a one-to-one sonification, the system does respond to dynamic changes in a representative fashion. A sunny autumn afternoon. Winds still to breezy (10mph) from multiple headings; Temperature 10°C; Low humidity, no rainfall. Autumn rainfall initially 0.11 rising rapidly to 0.19 inches per hour. Air pressure 1015 mb; Temperature 9°C; winds 4-10 mph North-East; humidity 92%. The Weathersongs installation has been on public display in North Wales and Italy.